With over 690 miles of shoreline, Lake Lanier provides something for everyone. It is easy to lose yourself in the peaceful tranquility of Lake Lanier. Whether you’re looking for a place to store your boat, service your boat, rent a boat, or buy/sell your boat we have it all at Port Royale Marina. The marina is only 45minutes north of Atlanta in Gainesville, Georgia. We offer drystack and covered and uncovered wet slip boat storage as well as dry shed self storage options for your boat. Become a member of Port Royale and enjoy being part of a full service marina. Our full parts and service center can diagnose and repair your boat’s issues and get you back on the water fast. Our certified technicians have many years of marine engine experience and have the know-how to keep your boat performing it’s best. Request a storage quote online or visit our service center to speak with one of our representatives to see what we can do for you and your boat. Looking to rent a boat? Check out our extensive fleet of boat rentals available to rent at Paradise Rental Boats. We rent everything from Pontoons to WaveRunners to large party boats. Perfect for any occasion – family reunion, reunions, get-togethers, bachelor/bachelorette parties, birthday parties, and more! With the newest boats on Lanier, you can’t go wrong renting at Paradise! Ready to buy or sell your boat? Park Marine Boating Centers can help get you on a new or used boat or help sell your old one. We sell Yamaha Jet Boats, Yamaha WaveRunners, Bayliner Boats, Sun Tracker Pontoon Boats, Tracker Fishing Boats, Hurricane Deckboats, and Tahoe Boats. We also offer our boat broker service to help sell your boat quicker and with less of a hassle than doing it on your own. 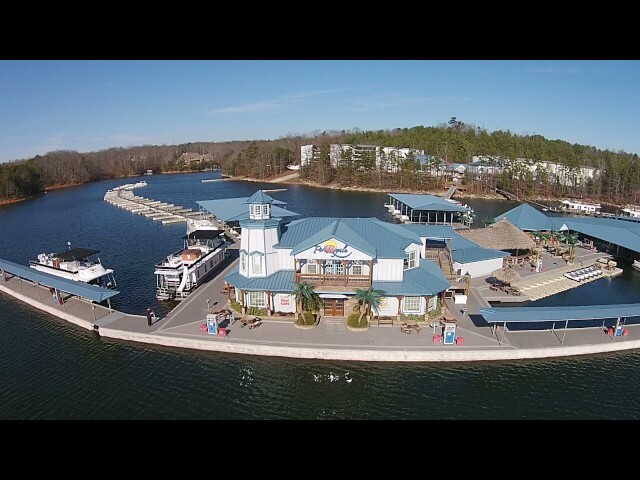 Pelican Pete’s is the only restaurant on Lake Lanier where you can cruise on up to! Yes, we are a floating restaurant- how cool is that?! Join us for fun, food, friends, and good times! We have live entertainment Friday- Sunday to add to the beachy vibes we have going on here. Relax, you’re on Lake time- grab a frozen drink or cold beer, and enjoy good food, good drinks, and good times! Paradise Rental Boats has the largest boat rental fleet and the largest rental facility on Lake Lanier. We have been proudly serving metro Atlanta, Georgia over 30 years. Our fleet has grown to over 200 new boats. We carry the absolute best boats the industry has to offer. Take the helm of one of our brand new pontoon boats, waverunners, deckboats, runabouts, party boats, or houseboats. Why not have a family reunion, birthday party, or anniversary on the lake? In addition, try skiing, fishing, or tubing- whatever floats your boat! It’s hassle-free and simply too easy to pass up a day of fun and relaxation on the water! Rent a boat on Lake Lanier, Lake Allatoona, or Lake Monroe this Summer! Our Houseboat Rentals on beautiful Lake Lanier accommodate 16 passengers while sleeping 10 comfortably. The upper deck with flybridge includes a waterslide, dining area, and wet bar for your all your entertaining needs. Our Houseboat Rentals include everything you need for a weekend getaway. Check out the Full kitchen, 1.5 bath, 4 private bedrooms + a sleeper sofa, family room with satellite TV, in addition to the dining area with a gas grill on the patio! The only restaurant on Lake Lanier where you can cruise on up to! Yes, we are a floating restaurant- how cool is that?! Join us for fun, food, friends, and good times! We have live entertainment Friday- Sunday to add to the beachy vibes we have going on here. Relax, you’re on Lake time- grab a frozen drink or cold beer, and enjoy good food, good drinks, and good times! Great food and drinks make for the perfect little lunch getaway or join us for dinner to wrap up a fun day on the lake!